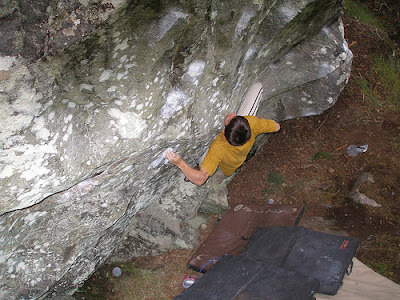 In between days of drizzly rain or tropical downpours, it's hard to commit to Scottish climbing: the mountains are wet, the bracken is too high and tick-ridden to walk anywhere off-piste and the weather is too muggy for bouldering or sport. 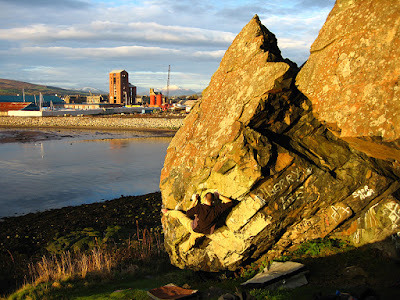 So oddly Dumbarton Rock has been an interim saviour until things dry out properly. The hefty breezes and morning showers cool the basalt enough to make it fairly gritty and the slopers don't feel too bad. I started work again on the harder 7c extension to Consolidated, the one which drops down to the triangular block and fights it sway to the cave, which I'd never really 'consolidated' enough to complete. Three sessions have re-wired old engrams in my brain, one session with Mark Garthwaite proving I should stick to the short-man's complex sequence of endless 'adjustment' moves (Garth stretches and spans through ridiculous long crucifixes, making it shorter but maybe more sapping in the end...), so I found myself twice 'round the corner', but what is easy in isolation becomes desperate at the end of a thirty move 'approach'...it's a real redpoint crux and very much like traversing the endless lip of a sports cave. 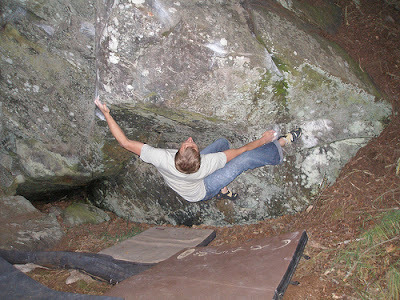 One more session....I know what will happen, skies will clear and I'll blow it by dissolving into the mountains until the autumn bouldering season! I was chasing the Birdman of Easter Island at 30,000 feet... nothing but endless cumulus shrinking in perspective, the comforting thrum of the Airbus maintaining its faith in degrees of magnetism and riding out the turbulence with ease. Then it comes into view through the porthole windows, easily encompassed by this small frame, as absurd and tiny as a beer bottle top afloat a reservoir. Five hours in a jet-plane from anywhere... this is true isolation. Easter Island is the story of what happened after Hotu Matu'a first arrived in his astonished canoe on the sands of Anakena beach sometime in the first millennium CE. The story of its people - the Rapanui - is a tale of paradise, loss, rebirth, tragedy and persistence. From the basalt 'Moai' heads that populate the island with noble countenance to the sports-autocracy of the Birdman cult, to the asbestosis-lunged poverty of the modern era (barely offset by the ambiguous balm of tourism), Rapa Nui, or Te Pito o Te Henua (the local name means something like ‘the edge of the world’) still maintains its human spirit and aura, despite its fretful abuse of paradise. Countered at every turn by predictable but unavoidable strife, its history is a living story-board of human weakness and ruined potential. The Moai gaze at the skies, or at the ground, with a palpable nonchalance, a code of silence pursing their lips, testament to the idea of a better and more creative world, whereas the fallen Moai remind us of the fragility of human ambition. Everything about Easter is a seductive mystery: the Moai; the almost-vanished Polynesian bloodline; the Birdman cult... the very fact that this island was found in the first place, poking its three meagre volcanic noses above the vast blue tablecloth of the Pacific, 2300 odd miles west from Chile, with Pitcairn Island a further 1300 miles to the west. It's a tiny target to find from a plane - despite radar and GPS - so how did the Polynesians discover it from sea-level: without compass, without a map, without even the faith that it was there? The 'greatparent’, or Hotu Matu'a, was a Polynesian king who set sail from one of the nearer Polynesian islands - most likely Pitcairn or Mangareva - in a sailed catamaran canoe caulked with moss, with a crew of intrepid and trustful souls, with chickens, seeds, dried provisions and faith in their navigational skills. They would have canoed out boldly at a favourable time of year when the trade winds reversed, possibly during regular ‘El Nino’ events, at night they would have looked east, maybe taking bearing from the rising moon or a familiar star, or even watching for landward-trailing streaks of bioluminescence. During the day, they would have kept lookout for the signs of land: seabirds, floating weed, cloud clusters or changes in currents and swells suggesting archipelagos. The most reliable sign of land however, were seabirds, which would have covered the mainland of Easter Island (now the noisy boobies, frigate birds, albatross, terns and petrels are confined to the safer subsidiary islands and stacks offshore). Considering a seabird's feeding range is up to 100 miles from shore, this gave the Polynesians an imaginary landmass of about 200 miles wide to discover, so maybe this evened the odds a little. Still, it must have been a tremendous relief to have found Rapa Nui and have claimed it for themselves in those early and bountiful years. Easter would have been covered by landbirds, turtles, great Chilean palm trees, skirted by cliffs with screaming seabirds, the crashing deep waters filled with dolphin and tuna. Hotu Matua would have been able to proclaim this land his own kingdom and look what riches faith in him rewarded! This is the beginning of the story of Easter Island. It would be another millennium before the Europeans arrived; in the meantime, they had a civilization to build. The island is an anthropological museum in itself - noble Moai heads stand testament everywhere, carved with a magical stylized beauty, gazing out from their stone platforms (ahu), overseeing abandoned villages and flat areas that once saw cultivation. Standing in front of their stern visages, you can palpably feel the ghostly bustle of life around you: the chickens rounding round, children playing, people lighting fires in supplication, or the distant sound of community effort as the latest revered head is dragged along with thick ropes towards their radial destinations from the great 'nursery' quarry on the slopes of Rano Raraku. It would have been an awesome sight - lines of lithe Polynesians, hauling along these delicately carved heads, some of them up to 90 tons in weight. The feeding, organization and political stability to carve, transport and erect nearly 700 statues on the island, is testament to a powerful and complex social system. While trees were plentiful, food abundant and population low, Easter Island allowed the first settlers to grow their civilization and erect their stone statues and live in some idea of Elysian paradise. So what happened? Why, when you visit now, do the restored statues only amplify the tragic and sad visages of so many hundreds of toppled Moai? The island in fact would prove more delicate an ecological system than this early paradise would suggest. You have to look closely at the reality of Easter Island's physical nature. It is an island of volcanic suddenness, like a brief geological experiment (it's only 3 million years old). Lava from deep oceanic faults welled up and solidified above the sea and cinder cones grew around and filled in the gaps between the volcanoes. Eventually an island 66 square miles was born, shaped a little like a triangle with three corner craters where the main volcanoes of Poike, Rano Kau and Terevaka (in order of age) swelled the landmass. Then plants would have taken root: grasses, the Toromiro shrub-tree, Wine Palms... birds settled on the cliffs and on the mainland, for there were no predators or mammals, and it would have greened over slowly as the rich bird-guano fertilised the more sheltered areas. However, it is still a barren and bleak place, the winds blow constantly and the sudden downpours strip the land of fertile red soils. Only the sheltered corners round Hanga Roa (the modern 'capital') on the west and Anakena to the north would have allowed trees the shelter to grow. When Hotu Matu'a arrived, it was a smorgasbord of birds and greener than it suggests today, though the modern Rapa Nui have planted Eucalyptus, banana and other trees so it can feel quite tropical around Hanga Roa. But this belies the thin skin that is the fertility of the island. Great middens of bird bones suggest the early islanders culled at will. Native ducks went extinct, as did any other landbirds, leaving the seabirds to escape to the sheer cliffs of the Motu's or island stacks. It seems that over a millennium the Easter Islanders came to understand the fragile nature of sustainability. They did cultivate land however: large Hare Paenga, large elliptical stone house foundations, suggest an elite culture of overseeing priests, who managed agriculture, irrigation (there are no rivers and on the island, just three crater lakes) as well as shelter (stone houses for chicken coops, stone-walled gardens). Sweet potato was brought in (maybe later from South America), and it did get to the stage, as kings demanded larger and larger Moai to represent the honour of their bloodline, that a kind of Tesco-culture took over... centralised supply systems, well organized and integrated, must have kept the culture alive for centuries, allowing a labour/slave culture to be at least well-fed, a bit like our own at the expense of the poor and powerless? Meanwhile, the weather was clement, 50 inches of rain a year, a few storms, but no frosts and a constant temperature. The volcanoes were no longer active and the crater lakes would have provided fresh water and reeds for domestic use. The island rang to the sound of stone chisels and industry. When Jacob Roggeveen, a Dutch explorer, arrived in 1722, and James Cook fifty years later, they noted a few standing Moai, many toppled Moai and a small population subsisting on what looked like a barren land - Roggeveen wondered where the materials (trees!) to transport these giant heads had vanished. The land was a windy lava-scape with locals pecking out an existence just like the chickens. What happened in between is a tale of mostly mystery (and what happened after European arrival is a tale of disease and slavery and human catastrophe). The key to the downfall of the Moai culture is undoubtedly closely linked to the ecological tale of vanishing resources and unsustainable practices. It is estimated the apogee of population was likely to be at least 15000. Imagine the trees 'required' for work (ropes, sleds, cranes for the Moai), for firewood (there is precious little driftwood on the island) and for housing (the Hare Paenga required thatching and had elaborate wooden scaffolding)... these pressures over the key 'high-civilization' centuries between 1200 and 1600 would have put tremendous strain on the ecology of the island. Trees would have been chopped faster than replenishment (it takes an hour to fell a tree with an axe, over forty years to grow it to harvestable size) and food would have become a huge issue, especially as the Moai suggest a culture of betterment was followed (bigger and bigger statues, more and more workers, more food required...). Birds disappeared to the islands and gathering eggs and seabirds would have become more like the dangerous St. Kildan model of cliff-climbing and bird culling... indeed this mutated into the later Birdman cult. Trees for good canoes would have become scarce, (dolphin bones disappeared from archaeological records after 1500) eventually leading to small surf-board style reed-built rafts. All in all, things just got too big and disorganised and war broke out, the whole industry ground to a halt (tools were downed at the quarry, half-carved Moai just left to history's gaze) - indeed, it all looks like Revolution from a distance. Certainly the culture descended as far as cannibalism at one point (cracked human marrow bones in middens bring shivers to the spine). What is certain about Easter Island history is the Moai culture was brought to ground - literally, the clans or the plebiscite pulling down the Moai onto strategically placed stones so as even to break their necks (many restored Moai have their heads 'cemented' back on). The colourful red 'top-knot' stones (pukao) lie strewn everywhere, the prone Moai lie mumbling into the earth, or the supine Moai eyes fill with watery tears in the rain... nothing is as sad as this once great Kingdom's worn face in the punishing tropical rain. Or is it sad? Is it not just a reflection of people's democratic grievance against kings gone mad with megalomania? I watched the Saddam Hussein statue toppled in Baghdad on satellite TV - a local man even took off his slipper and smacked Saddam round the ears... is this not a natural human response to abuse of power? The Rapa Nui certainly took matters into their own hands but could not replace the social structure and complex stability of the previous culture simply because the resources were gone. The population imploded, death became commonplace and then, as if things were not bad enough... visitors arrived. The afore-mentioned Jacob Roggeveen may not have been the first outsider to visit, but he was certainly the first to document his visit and gave the modern European name to the island (they arrived on Easter Sunday). There were other visits in the 18th century, most notably a Spanish survey ship of 1770, which produced the first map of the island, then James Cook's visit of 1774, who found the island humanly 'miserable'. By then (and since from about 1680) the culture had become a war-torn feudal system under the 'matatoa' warrior clans - no Moai were erected any more and people were cowering in caves along the coast, afraid for their lives. This is where the Birdman flew into Rapa Nui history. A cult developed round an obscure yearly ritual - the gathering of the first Sooty Tern egg. This cult was centred around the Orongo village on the cliff-top of the southwest caldera of Rano Kau, above the modern town that is Hanga Roa. Basalt outcrops still bear the beautiful petroglyphs of anthropomorph birdmen (tangata manu), their crouched bird bodies and long beak-faces over an outstretched human hand proffering a single egg. Lean, large-eyed faces loom out - this is Make-Make the creator god. One wonders why this village is perched so precariously between a crater-lake and a crumbling 1000 foot cliff. The answer is with the birds. As I mentioned, resources had become a premium, trees had vanished and birds became the gold of the new culture. Offshore of Rano Kau, in full sight of the Orongo village, are the three small islands of Moto Nui, Moto Iti and the sea-stack Moto Kau Kau. They are packed with noisy terns, petrels and frigate birds, all nesting safely from predation. Only no longer... the Birdman culture would have gathered birds, eggs and fish from the islands and waters round these islands, using reed-canoes and body-floats for swimming. A yearly sports-autocracy developed round the Birdman ritual. Each chief would choose a fit representative (most likely ambitious young warriors) who would race and climb down the treacherous cliffs, cutting themselves to ribbons no doubt, or falling to their deaths. They would then throw themselves on their reed-boards and swim to the islands, nervous of the blood spoor they were leaving for sharks. If they were lucky enough to reach the flatter distant island of Moto Nui, they would gather a single tern egg, wrap it carefully in a head-cloth and make the return journey. The first back would present the egg to the new Chief, who would be secreted away to grow his fingernails in a luxurious year of largesse and attendance. This gladiatorial opera could be watched from the booth-like village on the cliff-top, the low stone houses with grass 'picnic' mezzanines for roofs. This was Orongo... this was the cult of the bird and one of the most bizarre and mind-boggling cultures we have created in our human history. It was also fairly stable politically, maybe it was the low population and hand-to-mouth sustainable nature of a limited resource, but it endured for around two hundred years even into the 'modern' era with the last ritual held in 1867, before the Catholic priests aborted the whole affair with their missionary zeal (though the wooden Crucifixion Christ in the Hanga Roa church still retains the head of a bird). Disease, especially smallpox, was the next disastrous import to Easter, responsible for sudden haemorrhages in the population. Then in 1862 Peruvian slavers abducted over 1500 islanders for work in the Peruvian mines, the aforesaid Catholic missionaries arrived in 1864, and by 1872 the population had declined to as low as 110 pure-blood Polynesians. 1888 saw Chile annex the island and turn it into a sheep farm (owned by a Scots company), herding the locals into the fenced-off concentration camp based in Hanga Roa. A rebellion was quelled in 1914 and the islanders only received nominal freedom in 1966. Modern Rapanui still tell of their grandfathers' memories of being contained in the 'camp'. Perhaps the greatest hope for the human culture of Rapa Nui lies in modern tourism. The island is largely preserved as National Park and development has been thankfully kept in check. A few flights a week bring precious money and tourism to Hanga Roa natives, cruise boats cannot berth by the wharf-less lava coastline but must send in landing parties, and recent attempts by corporate hotel chains to turn Easter Island into the new 'Tahiti' have been resisted. I felt privileged to watch the indigenous Polynesians practising their traditional 'story' dances, their language rich and rhythmic, their dancing at once vibrant and warrior-like, the next subtle and subdued, telling the 'Rongo-rongo' tales of past glories and fables. They are proud of their bloodline, are politically at odds with Chile (who have sold them cheap and deadly asbestos for building material). But inevitably, modern Rapa Nui has become a blend of European, Colombino and Polynesian. The Polynesian asserts itself most strongly. Ugo, while teaching me the Polynesian Ukulele, points at a frigate bird gliding over, touches my elbow and speaks out its name plosively in Rapanui: 'Ma-KO-he'... then lets me resume my arrhythmic European strumming. All the animals are sacred on this island as there are so few and their history so intertwined with the human population. The Sooty Tern, the Frigate Bird, the Turtle, the Tuna fish (which Tuti mixes raw into a seafood salad to cure our hangovers). There are no mammals indigenous to the island, except perhaps these descendants of Hotu Matu'a . All the rest are introduced: horses, cattle, sheep, goats, rats, cats and the clone-like skinny Alsatian dogs that roam everywhere and bounce off the wings of cars in yelping wheel-chasing hordes. This is an island to savour and cherish, to arrive excitedly and leave sadly. It is an example to us all of human failure in the face of delicate ecology, also of human resistance and endurance in the face of adversity. We can only hope the local culture endures and the island's magical aura will remain in future for us all to find a distant mirror of our potentials.